The differences in the performance and presentation of Hypercaffium Spazzinate from every other Descendents album are subtle but evident from the moment â€œFeel Thisâ€ screeches in to open the album. There, while the tempo of the drums and guitar are precisely at the speed fans would expect them to be (at that of an over-caffeinated blur, of course), the tone in Miloâ€™s voice has changed to reflect a different demeanor from that of any of the ones which have appeared on The Descendentsâ€™ previous albums; a little deeper, less nasal and a little more hardened than ever before, Miloâ€™s voice sounds a litle harder worked than it ever has before (which may just be due to the fact that the band has toured harder in recent years than they ever hae before, but itâ€™s still worth pointing out). Regardless, fans will have no problem falling in line and loving it as the band rails its way through the song at a breakneck pace and Aukerman offers up gems like, â€œBusted heart, my brain is beat yeah/ Donâ€™t want a doctor/ Need zero anesthetic to make me numb/ Escape is easy and everybodyâ€™s offeringâ€ because the spirit and energy is precisely what theyâ€™ve always expected from this band â€“ nothing appears diminished at all. That energy continues through â€œVictim Of Me,â€ â€œOn Paperâ€ and â€œShameless Haloâ€ too; in each of those cases, guitarist Stephen Egerton zooms through with such speed and metered consistency that it seems as though he might be playing his guitar with a whipper-snipper, while drummer Bill Stevenson hammers through with even more power and precision on his kit than heâ€™s showcased before. Hypercaffium Spazzinate truly does blaze through its early playing like a charmed offering. 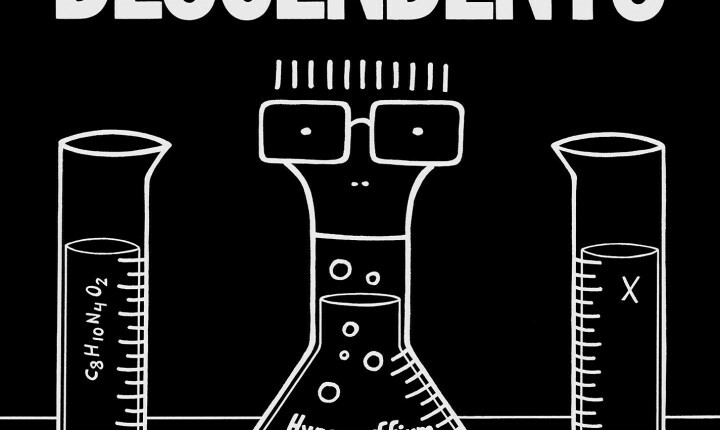 At about the midpoint of the album, The Descendents begin boldly examining their age as the tape rolls but, rather than just feeling like a trite concession of fact (like saying â€œOkay â€“ weâ€™re fifty!â€ like The Ramones did when they released their farewell album, Adios Amigos), the band has a little fun with it instead. On â€œNo Fat Burger,â€ for example, Aukerman bemoans the fact that he doesnâ€™t get to indulge is favorite culinary subject (greasy food) anymore, as he complains â€œCanâ€™t have no more juicy burgers/ Canâ€™t have no more greasy fries/ Doctor took my lipid profile/ He told me Iâ€™m barely alive,â€ before punctuating it all with the sour point (which echoes back to the bandâ€™s 1981, Bonus Fat EP) â€œNo more fat/ No more fat/ I like food, but all the food that tastes goodâ€¦/ I canâ€™t have that.â€ In that, longtime fans will giggle because the venom in Aukermanâ€™s voice is impossible to miss and illustrates that the singer hs aged well because heâ€™s actually accepting his age; it doesnâ€™t happen often in punk rock, but it does here and works incredibly well. It proves to work very well in â€œTestosteroneâ€ (where the band looks at hormone therapy in a more ironic way than they once did at not being the tough guy back in 1984), Without Loveâ€ (where the band concedes that they never grew beyond the socially awkward stance that theyâ€™ve been stuck in since the early Eighties) and â€œFull Circleâ€ (where the band rightly observes that, while they may have come far, they never quite left places they knew and people they were back at the dawn of their career); of course, none of these subjects are new, but theyâ€™re approached from a very different vantage which makes them feel fresh and exciting all over again.